Foxes live in many different habitats all over the world. They do not just thrive in their natural habitat, but have adapted well to areas populated by humans including the suburbs. Foxes are solitary and do not live or hunt in packs. They are very smart and incredibly resourceful animals. The fox’s diet is variable. They mostly like to feed on different rodents, birds, rabbits and other small animals; however, they are very flexible when it comes to eating. They will eat fish, amphibians, garbage, and pet food among other things. If a fox is raiding a farm raising animals for food like chickens, eggs, rabbits, or other small animals, the effect can be economically catastrophic. In order to avoid any more loss, catching the fox and removing it is the only thing you can do. Foxes are attracted to smelly bait. Things like cat food, fish, pork, and other meats work well. Using meat like bobcat, beaver, and muskrat is very effective. If you decide to use cat food, pick a really fishy smelling one. Sometimes mice, raccoon and certain birds work too. There are humane traps created specifically for foxes. They are a good alternative to leg-hold traps. To get the fox into the trap, you may want to use step trapping. With this kind of trapping, you leave food out over a period of time to entice and gain the trust of the fox. The first thing to do in step trapping is place the cage. It should be well camouflaged. Foxes know when a trap is a trap. Put food outside the trap on the first night, at the entrance on the second night, and finally inside the cage on the third night. If you do not make sure the trap is well hidden or if your scent is all over it, the fox will learn quickly that it is not something they want to be around. They will remember that and you will have to change tactics. Again, foxes are very smart animals. The bait inside the cage should be attached to a line. The fox will pick up the bait, tug on the line, and the trap will spring shut. Make sure you are not leaving any of your scent on the trap. Wash it by boiling or air it out for a few days. Wash your hands before you set the trap to avoid any transfer. Cover the trap by sifting the dirt back into the hole. Take care to make it look as natural as possible. Place leaves or anything nearby on top of the hole to make it blend in with the ground. Finally, put a few drops of fox urine scent around the hole to help attract the animal. Another thing to use is a snare trap. A snare is a wire loop made into a noose and anchored to a fence or other stationary, solid structure. Foxes use the same paths over and over again to get to their destination. Watch for a couple of nights to find out where they are entering and set the snare trap there. As the fox moves through the snare, the trigger is tripped and the wire closes around their neck. The fox will struggle, so be sure you have the trap anchored properly. These traps are not usually fatal to animals. You can try to relocate the fox far away from your home or farm. Foxes are solitary and very territorial. One fox controls a certain area of land. If you put the fox somewhere undesirable, it will likely end up back on your land. Another option is calling a wildlife control company to trap and pick up the fox. 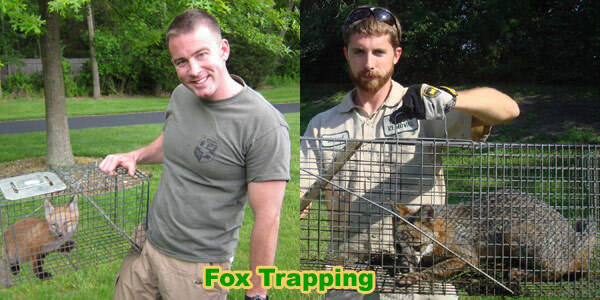 Be aware that the fox will possibly be humanely euthanized since it is a known carrier of rabies. This site is intended to provide information about how to catch a fox, so that you can make an informed decision if you need to deal with a fox problem. This site provides many fox capture articles and strategies, if you wish to attempt to solve the problem yourself. If you are unable to do so, which is likely with many cases of fox removal, please go to the home page and click the USA map, where I have wildlife removal experts listed in over 500 cites and towns, who can properly help you with your nuisance fox. Click here to read more about how to get rid of foxes.